Order your Laceeeis Corset Kit in 3 easy steps! 1. Choose your Fabric Type. 2. Choose your Corset Length. 1. Fabric - Which Fabric Option do you want? We offer Corset Kits in Satin, Taffeta or Lamé Metallic. You can choose to match your gown, or accent with a different fabric type. 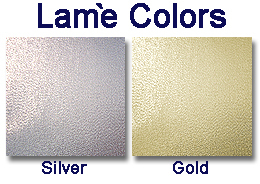 Please scroll down to the bottom of this page to see our color options for each fabric type. You can also order a Fabric Sample Card, which has actual fabric swatches so you can match your project perfectly! 2. Length - What length of corset do you need? 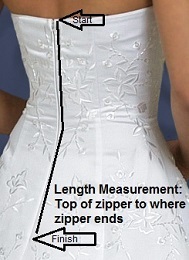 To figure out what length of Corset you need, measure the length your zipper. Measure from the top of the zipper, to where it ends. Our Corset Kit system is available in a variety of lengths. Use the picture to the left as a guide of where to measure your zipper. You can order your Corset Kit in any of our standard options, from 8" to 18" long! Corset Kits are also available up to 24" long as a special order. 3. Color - What color corset kit is best for you? 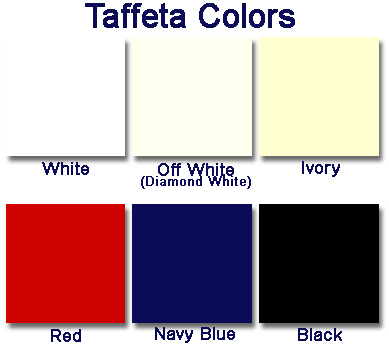 With 20 color choices in stock, we are sure to have the right color for you! Various shades of whites and ivories make it easy to match your gown perfectly! If you are not sure what color you need, please order a Fabric Sample Card from the Products menu, and we will mail out actual fabric samples for you to compare. Scroll down to the bottom of this page to see fabric color options. Laceeis Corset Kits - An easy way to replace a zipper! You can install the Laceéis Corset System in minutes, and it just takes three easy steps. All you need is a sewing machine. With just minimal sewing skills the Laceéis™ Corset will give you professional results. You can even install our corset system without removing the zipper and later remove the corset leaving your Gown intact! Are you making a Gown? Install the Laceéis™ Corset and you won't have to worry about whether your dress will fit on the big day. With the Laceéis™ corset, your Wedding Gown will adjust to you! We sell our Laceéis™ corset system, as a kit and can be used with any pattern as well as used as a zipper or button replacement for purchased Dresses and Gowns. *The modesty panel is the piece of fabric that fits behind the lace up, so that no skin shows through. Each modesty panel is 7" at the top and tapers down to 3" at the bottom. If larger is needed, please email us before you order for custom options.